Some people might think that living the van life is about the quiet life, taking a stealth camper out on the road and gently enjoying some of life’s top road trips. Others like to build a metallic-red dragon and drive into the heart of the sun, travelling in a van while eating up every other car on the road. 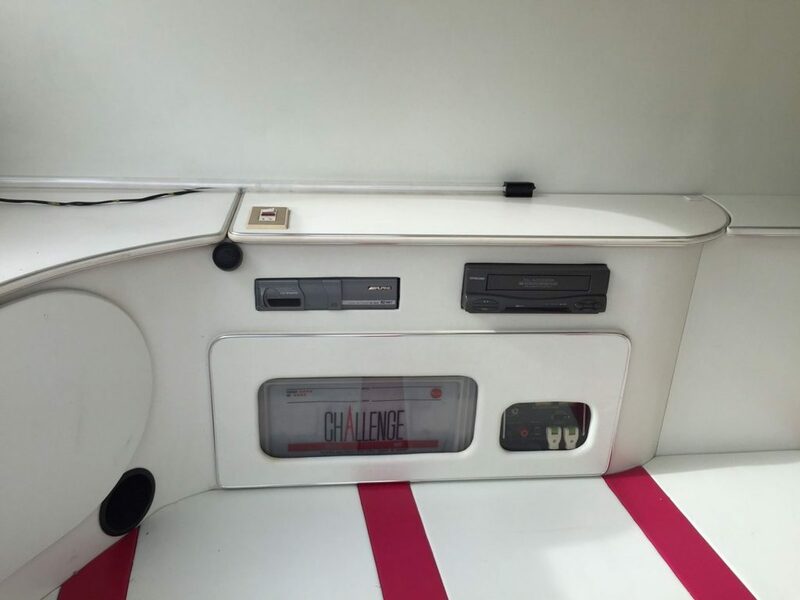 This is one of the only Vanlife Blogs where you’ll find such a behemoth modified campervan (unless you’re part of our Van Lifers and Weekend Warriors group on Facebook of course!). 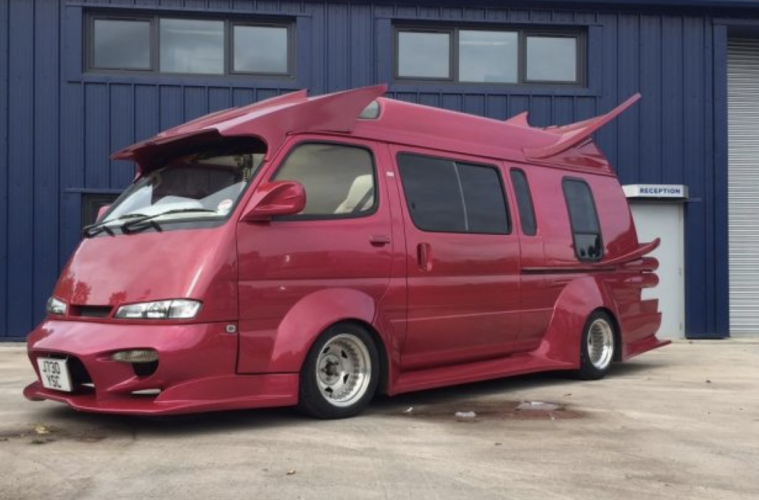 Behold this unique Toyota Hiace Modified Campervan; it’s certainly not like any other camper conversion that we’ve ever seen, and we’ve seen some pretty weird and wonderful ones over the years! Is it an eye catching custom camper or just an eyesore? Read on to find out! Well, you’ve got to admit that it does look pretty striking; you’d be hard pushed not to be seen in this thing, and there wouldn’t be any guessing as to whether the owner was at home or not when you walked past their house. This 2.8L diesel engine van was originally a Japanese import and is based on a Toyota Hiace long-wheel-base maxi roof. The nuts and bolts and levers might all be the same bog standard parts underneath, but this custom campervan is far from ordinary. Originally used for business advertising, this modified campervan helped its owners with their own import business, but now it’s gone on to pastures new to be raced around a small hamlet by a digital nomad with a taste for theatrics. Let’s start from the top and point out the elephant in the room – it’s magenta, massive, and a little bit like one of the cars that they might use on the wacky racers. It’s a little bit like one of those tacky shirts that you might have bought at a seaside resort as a kid with flames on it, only to look back it at fondly years later as your partner threatens to burn it so that the neighbours don’t see it. Whether you like it or not, the full Veilside body kit is a stand-out bit of design, and it certainly makes for a talking point if you’re stuck for conversation (or when trying to fill the word count in an article for instance). This modified camper uses a Veilside front bumper form a Mazda RX7 and the headlights from a Nissan S14A; it might be a mixture of lots of bits, but it’s still not as crazy as the CaravanBoat! The back end looks a little bit like the pipes that you might see in a church organ (and judging by the size of the exhaust it probably makes a similar din), and the exterior architecture is so big that it would have trouble fitting under bridges. Put it this way; you wouldn’t want to try and park this in your garage unless you have an aeroplane hanger. 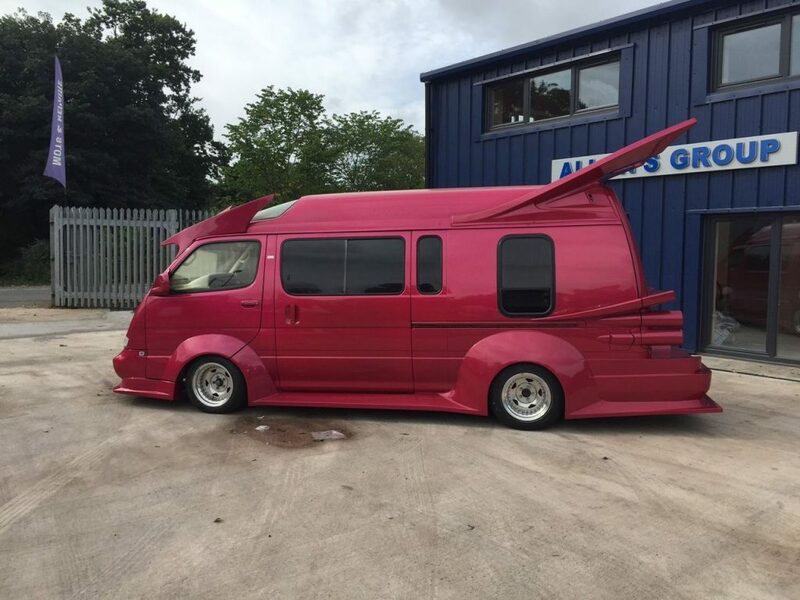 What’s Inside This Modified Campervan? Get ready for this – pink and white contrasting leather. That’s right; this whole conversion just took on a bit of an Austin Powers-style turn. It’s very much a camper designed to shock, but there are some great gadgets built inside this too. If you’ve compiled a list of your best road trip songs, then you’ll be pleased to know that it comes with 4 x 12″ Rockford punched Sub Woofers; now you can be the loudest person in the campsite! 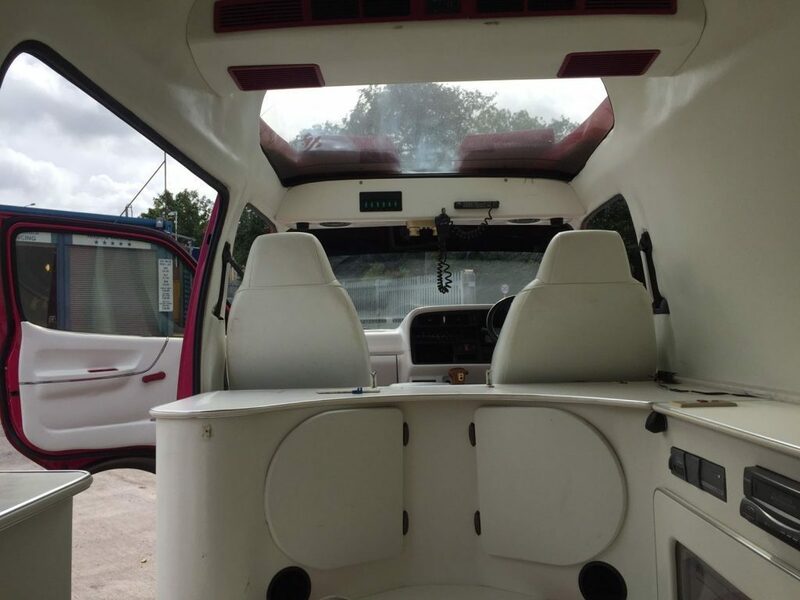 At the front of this modified campervan, you’ll find a window that you can use to gaze up at the night sky, and a place to let in natural light when you’re parked up and reading kung-fu manuals or writing a nu-metal album. There’s also an acrylic mirror that lights up on the inside of the roof too; looks like the adventure bus just turned into an all-night party bus. The neon lights will keep the celebrations going till dawn, and the built-in aircon is there to keep you cool on those warm summer nights. As far as custom campers go, this is one of the weirdest, and that’s taking the bicycle camper into account! It’s not something that we’d ask to be reproduced for the Van Clan fleet, but then again I’m not sure the value of this camper lies in its suitability for living off the grid. 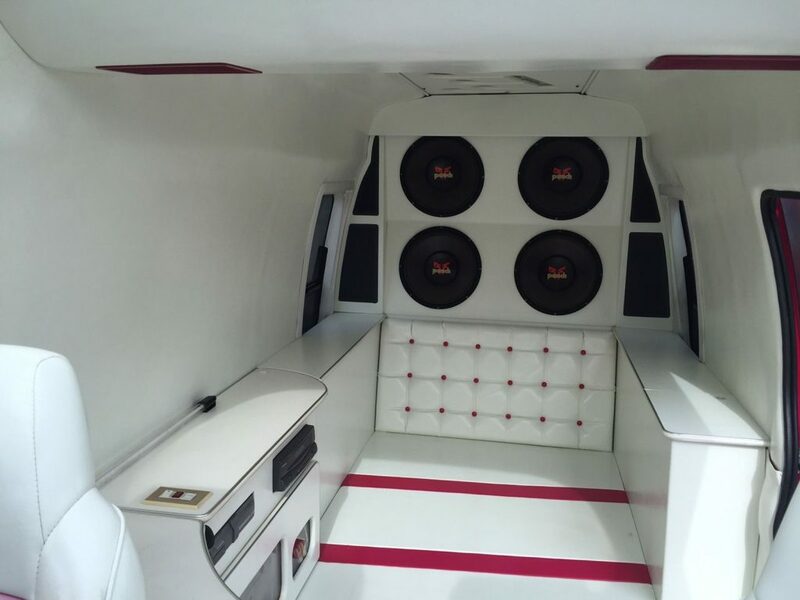 It’s a statement piece, and it does a great job of showing what a little bit of creativity can do when you set about converting a van. 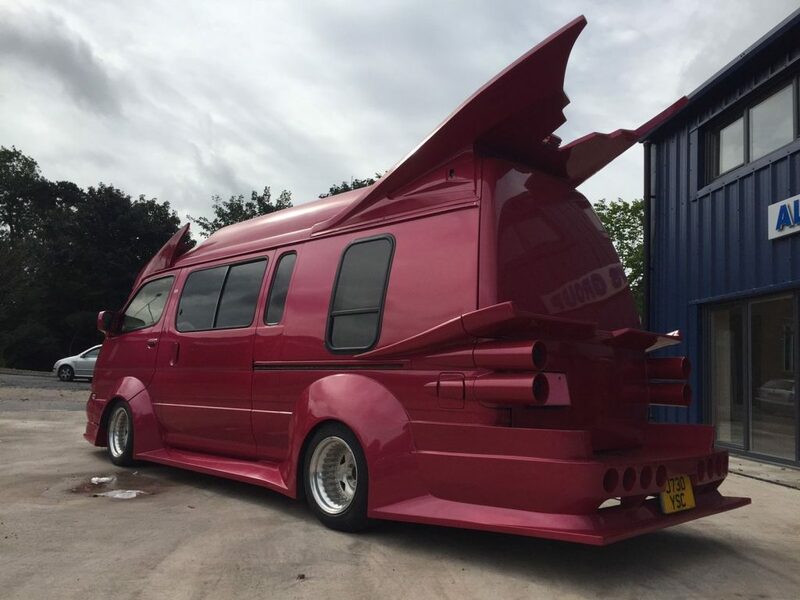 This particularly modified campervan was recently sold on eBay for just under £10’000, making it a cheap camper as well as a mobile disco. It might not be for everyone, but it certainly won’t leave your mind any time soon. Do I like it; in a way, yes, but I’m not really sure why. I wouldn’t buy it myself, but it would be a bit of a laugh to take it out through a sleepy town for a spin. I wouldn’t like to try and park it in a supermarket carpark though; looking at the paint job I’d hate to think what the car alarm is like! Check out these campervan gifts for the adventure lover in your life.